So your brand new kitchen cabinets are installed. They look gorgeous. They are everything you ever dreamed of. But there is one little problem. You need some knobs or pulls to make them function. Problem is you are terrified. 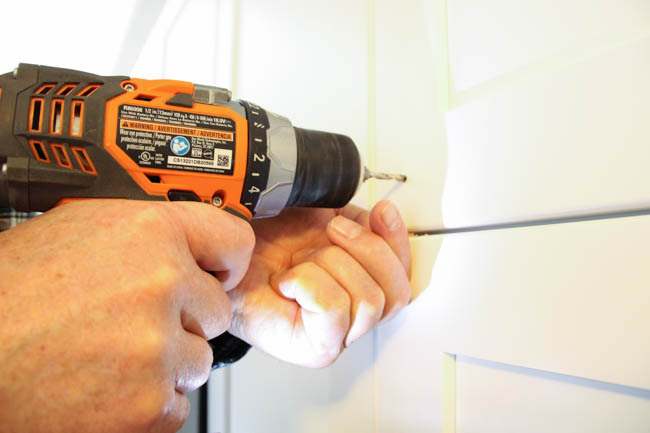 You have to actually drill holes right through those brand new doors in order to install those stunning new knobs that you so painstakingly selected. But what if you make a mistake? Don’t panic. I have a trick. I learned this one from my Dad and he knows ’bout this kinda stuff. He is the one who taught us how to install cabinet knobs with a template. So if you are worried about DIYing this, just relax. 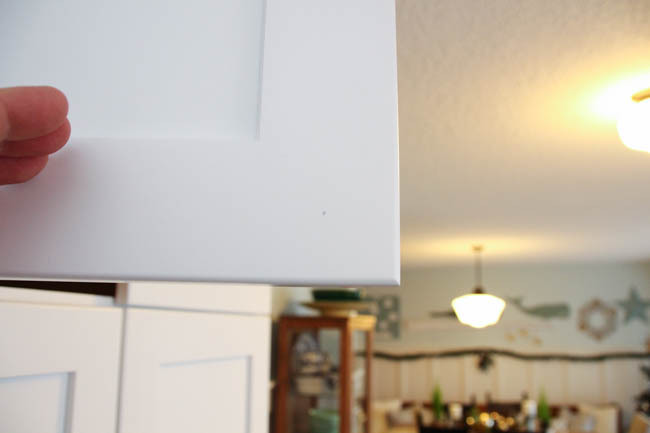 This easy trick will have those cabinets ready to open in no time. Selecting the cabinets was the easy part. I’ve known since I was about six months old that I wanted white shaker in a painted maple finish. That decision was no problem. Choosing the knobs and pulls was much harder. After hours and months and weeks and years and decades of pouring over all my options I finally settled on these beauties from build.com. 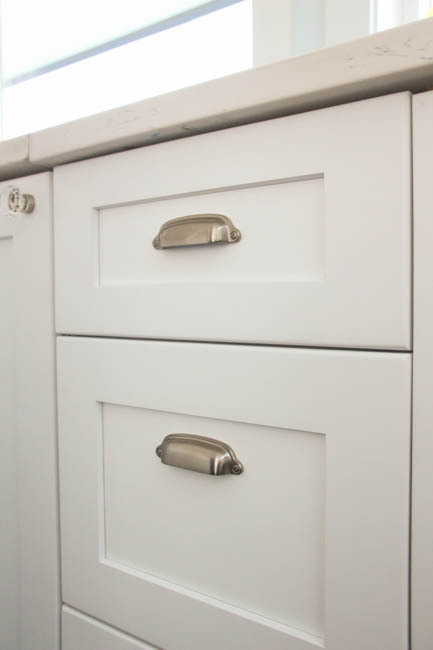 For the drawers I selected these gorgeous 3″ solid brass cup pulls by Century in a Matte Satin Nickel finish. I have always been a big fan of cup pulls. 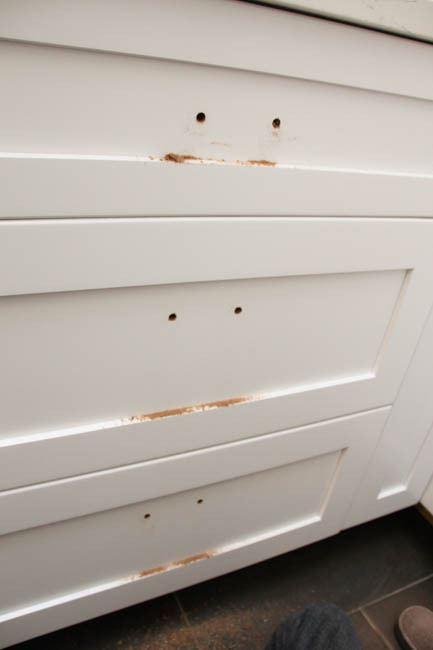 In fact, we have never had a kitchen where I didn’t choose cup pulls for the drawers. I even added new cup pulls to the kitchen and bathroom cabinets in our rental house. And these cups pulls are the nicest ones I have ever had. I love them. They have such a solid feel and I love the detail of the faux screw head on each end. I feel like I could be in a Hamptons kitchen somewhere with these beauties… like, maybe even at Martha’s. What do you think? I’m equally in love with the knobs. 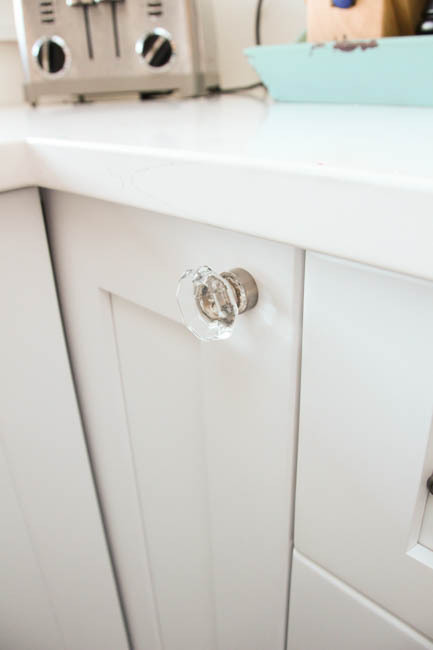 The doors are dressed with these stunning 1-3/8″ Clear Crystal cabinet knobs by Top Knobs in a Brushed Satin Nickel finish. I feel like they are the perfect little piece of jewelry added to the kitchen and add just the right amount of sparkle and bling while maintaining a cottagey vintage feel to the overall space. They, too, have such a solid quality feel and I couldn’t be more thrilled with them. 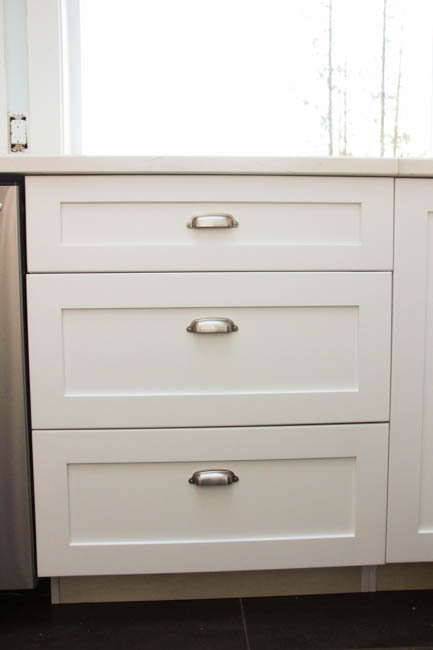 The trick is to figure out where exactly you want your knobs and handles placed and then to build a template so that you can easily mark where to drill on all of your drawers and doors without measuring and remeasuring and marking and remarking again and again each time. 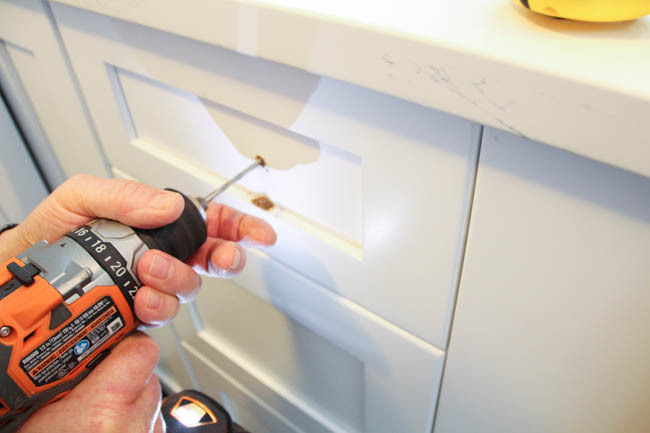 Next, just drill where you marked… being sure to use the correct size drill bit (match it to the size of your specific knobs or cabinet hardware). It’s so easy that you don’t even have to change out of your PJ pants. For the cabinet pulls we used the same kind of method. We created a template with holes predrilled at the correct width to match our cup pulls. The only difference was that we also needed to draw a line indicated the center point on our template, and then to measure and find the center of our drawers (the little T marks center on our template). We decided to install all the drawer pulls at the same distance down from the top of the shaker box, rather then centered directly in the middle (height wise) of the drawer. We have functional cabinets that actually open and close thanks to the beautiful new hardware. I love the pulls and knobs. What do you think?? I can put stuff in the cabinets and access it and then actually prepare food in a clean and functional kitchen. Do you have some hardware to install? 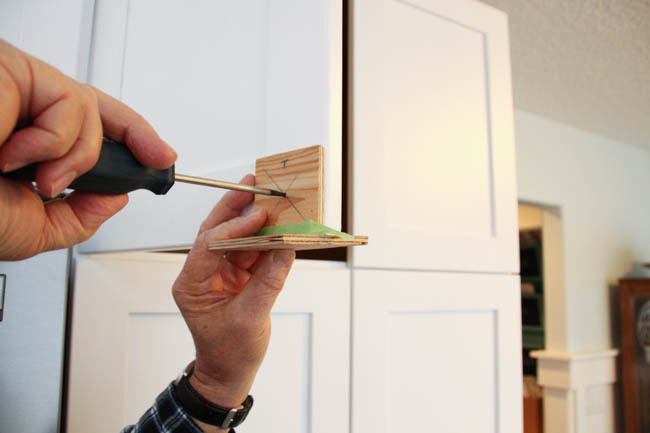 Don’t forget this easy method for how to install cabinet knobs using a template! 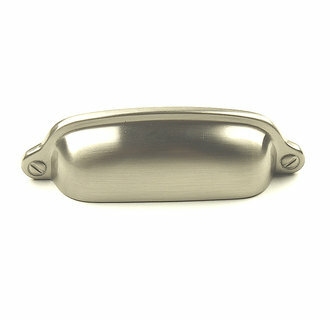 If you are looking for beautiful and good quality cabinet hardware at an excellent price, head over to see the cabinet hardware at build.com and check out their amazing selection. Beautiful cabinet and knob choice. I love the pulls with the sparkly knobs. The template idea is very clever. Do you know how this idea can work on a dresser? Thanks. 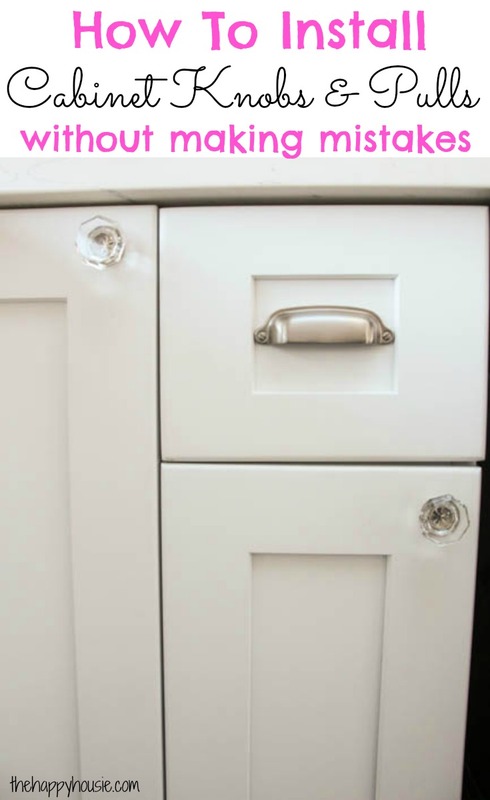 I think you could do the same thing – essentially decide where you want the knobs to go, then cut a small wooden or cardboard template out to adjust where they go, mark it on the template, and then line it up with the edge of the drawers or doors and use the template to help you evenly mark the dresser. The only thing that might change is if the dresser has different sized drawers and you want them to be centered in each drawer, no evenly spaced from the top or bottom. Good luck with your project! Oh Krista, your kitchen is everything I love!! 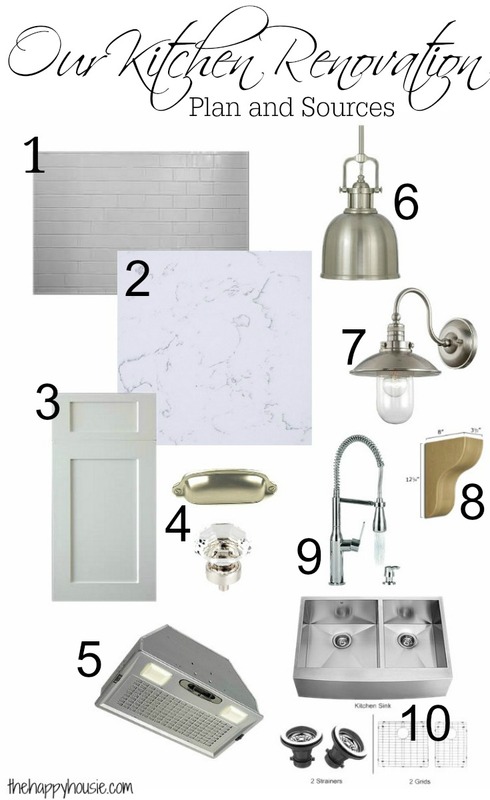 White shaker cabinets, silver bin pulls… I’m dying over here, my friend. And what a great tip! Thanks for sharing. 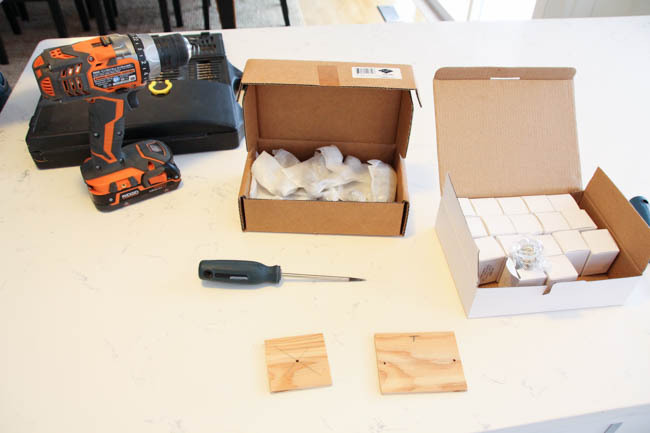 I have a great idea in this article that how to easy way to install cabinet knobs with a template. Thanks for sharing with helpful idea. 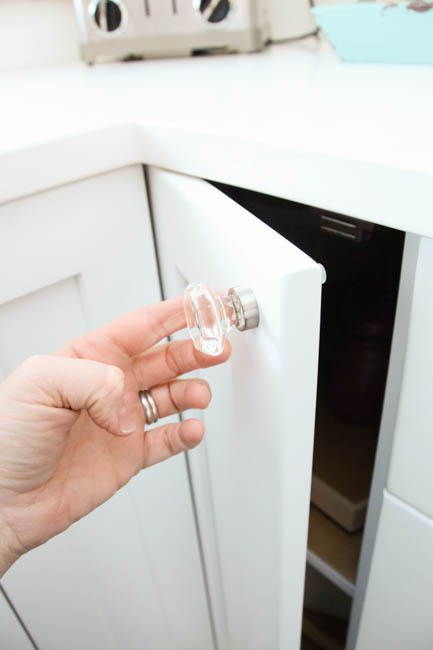 Thank you so much for the great tip to install cabinet knobs. I had no idea how easy the template made everything. Thanks to you (and my steady hand) the job turned out perfectly. So glad I came across your post. Thank you so much and the work you did is fabulous. I like that you suggest to figure out exactly where you want each knobs or handle and then draw a template to help guide you in placing it at the right spot. I can see why it would be a little frustrating to place it in the wrong spot. It seems like watching training videos would be useful before drilling the hole. Hi Scott, yes if you read the tutorial that is exactly what I am writing about, thanks. I have the same crystal pulls you have and I love them but Im not entirely sure how to install them. 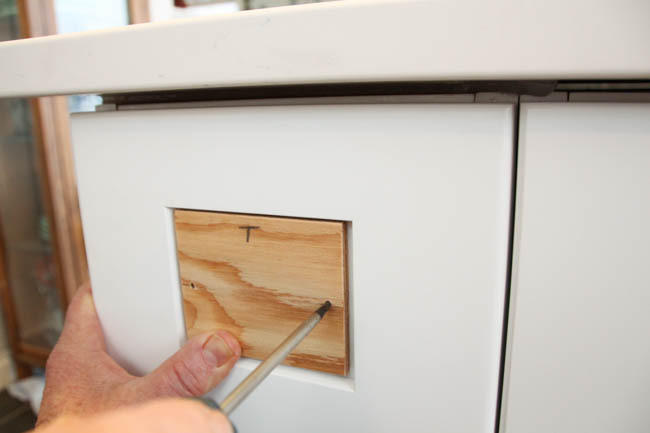 Did you use one size bit to drill the cabinet since the pull has a sink (the end that inserts into the cabinet)? Or did you drill half way through with one size and then another the rest of the way just big enough for the screw to fit through. Help!? Yes – the ends of the knobs have a “sink” as you called it – so we drilled the way you said second, I believe. It had to be drilled wider for the “sink” piece and then a smaller diameter drill hole for just the screw. Make sense?? Let me know if it doesn’t! 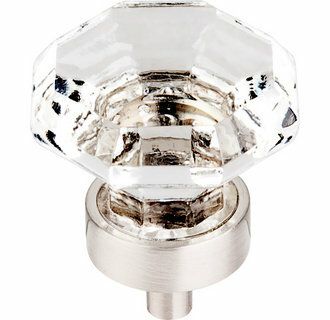 I just ordered these exact same Top knob TK128BSN Crystal knobs for my new laundry room. I found you because I could not figure out why there is an extension on this knob and how you drill the hole? Did your knobs have 1/2″ extension on the end? Also how did you mount them flush with you cabinet in that case? I called Top Knobs today and they said people like them to have the extension on them. Anything you can tell me will help before I return them. I love the look but do want them to be mounted flush. PS your kitchen is beautiful! Hi Kimberly! Thanks for your kind words!! 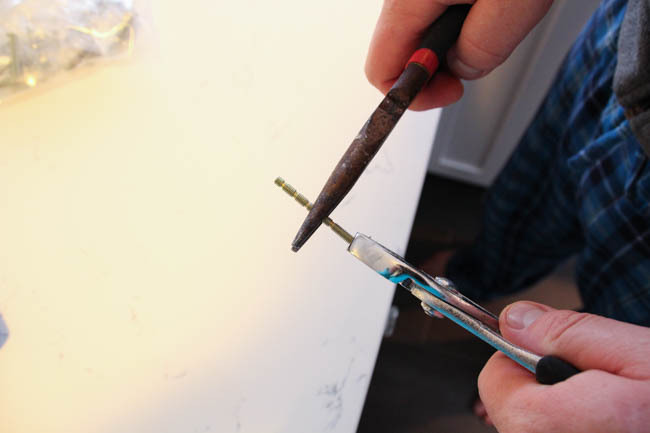 We did have the same extension on our knobs and we used a larger drill bit for the first 1/2″ and then a smaller drill bit for the remainder of the whole. I’m not entirely sure why they are designed that way, but I guess that the extension makes the knobs a little bit more stable and secure when attached to your doors. I hope that helps! Thank you so much for your reply Krista! Kim,the extension is so your fingers fit behind the knob! Hello. I love the crystal knobs, and would like to know if I can use them for dresser drawers? I think you definitely could! I don’t see why they wouldn’t work! 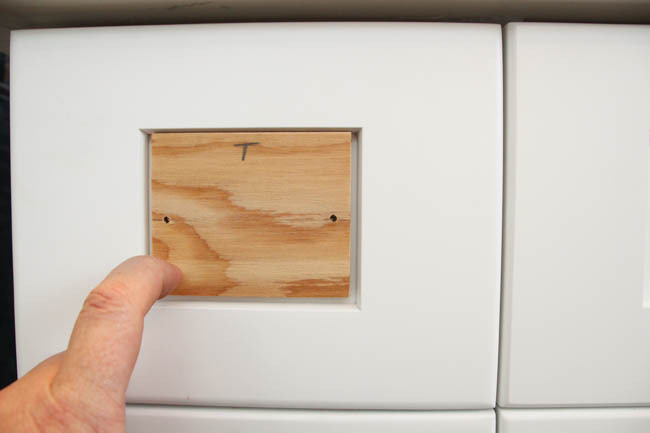 There are generally two ways to center your drawer pulls – either with all centered exactly in the middle of the cabinet fronts, or the second way is with all of the pulls at the same height down from the top of the cabinet. 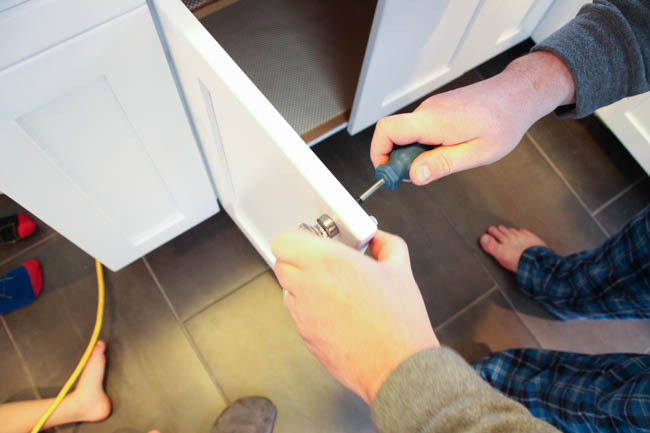 If you spend some time looking at pulls on cabinets, you will see that this is a common way to install them. Great tip for my next kitchen. Just sold the house I’ve had for 12 years and never installed pulls or knobs. Could never decide what I wanted. Well, the new buyer can have virgin cabinets to put openers on. Haha, well, I have to admit then when we bought this house the bathroom in the basement had brand new cabinetry with no handles. And nearly four years later it remains that way!! Gorgeous ,Krista! I’ve had similar pulls and glass knobs in the bathrooms of both of our houses. Great choice!! This tip could have saved me many times in the past. Genius! I am also dying how beautiful this hardware is. Such a stunning combination! What a great tip/trick, Krista!! Love the cabinets and that hardware is a perfect choice! Looking forward to the finished space – it’s shaping up beautifully! Love the cabinet hardware, Krista!! So pretty! So clever and I love those pulls, too!! Ahhhhh- yes. We have these brand new cabinets & I’m terrified to drill holes in them. We will be doing this before the end of summer I suspect. Gotta love the template & you chose some fabulous hardware.